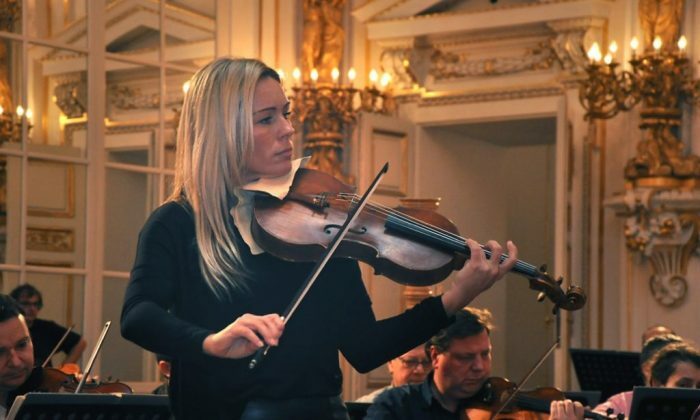 PRAGUE—Jitka Hosprova is the first Czech viola soloist to be recognized not only in the Czech Republic but also abroad. She is a keen promoter of classical music and presents in her performances the jewels of Czech viola literature, embodying the dynamic concept of classical music. Hosprova studied viola at the Academy of Performing Arts in Prague under Professor Jan Peruska. She also worked with the legendary Italian violist Luigi Alberto Bianchi, who brought her to the level of virtuosic mastery. As a soloist, she has worked with a number of internationally renowned orchestras and appeared at many international music festivals. She performs as a guest with leading Czech quartets, and, together with harpist Katerina Englichova and flutist Carlo Jans, they make up an exceptional group called the Bohemia Luxembourg Trio. Hosprova has had solo debut performances in London, Vienna, Paris, Stockholm, Rome, Santiago de Chile, Washington D.C., and New York. “Jitka’s passionate relationship to the viola gives the audience a clear awareness of the existence of this overlooked instrument. She presents fascinating viola literature and inspires composers to create new pieces for this instrument. She is a fascinating artist,” said DeeAnne Hunstein, director of Hunstein Artist Services in New York. We met the virtuoso for a brief interview at the cozy Maitrea restaurant near tourist-laden Old Town Square in Prague. The Epoch Times: When we met last time, we discussed your philosophy of life: the ability of man to rise above everyday hardships to gain insights and perceive life from another perspective. Could we reopen this topic? Jitka Hosprova: Well, for instance, I had a very special experience while studying the composers who were allowed to compose in Theresienstadt [German for Terezin]—the Jewish concentration camp in former Czechoslovakia [during its German occupation in] World War II. One would expect the music to be mournful, full of deep emotions, and [the composers to be] lamenting over their fate, as they knew their lives were about to end. Yet, ironically, the compositions by Pavel Haas (the brother of famous Czechoslovakian actor Hugo Haas, who emigrated to America in 1939) and others are beautiful pieces celebrating the joy of life. Their music is the proof that they lived life to the fullest, and, even though they had limited time, they were creating lively music right to the end. This inspired me so much in my personal life, teaching me to always look on the bright side of life. Pavel Haas wasn’t as lucky as his brother Hugo. He died in the concentration camp. Perhaps those people, at some point, also felt that this form [of human life] was not entirely final. Thanks to the situation they faced, they left us a great testimony—perhaps greater than some people who have lived their whole lives in peace, tranquility, and prosperity. Those people managed to kind of sweat out at the last moment something amazing. And when one plays their music, one feels closer to them. During my playing, I felt like we lived their story with them. The Terezin compositions were written for a string quartet, but we play it with only a trio. The reason is that before the premiere in Terezin, one of the musicians was sent to his death, to be gassed. Even without their teammate, they finished the performance, and they even recomposed the piece [for three players]. They lived to the last moment. This gives me a great deal of strength and an understanding of why it’s worth it to keep creating something, and why should one work on oneself [to keep positive]. The Epoch Times: From your words, I often get the impression that you have come to understand that classical music has the ability to lift us up to something higher, to a noble state of mind, to noble thoughts. Do I understand this correctly? Ms. Hosprova: Every time, even when I practice at home, I feel like I’m being cleansed by the music. I could be playing for three hours in a row, and I will not get tired because the [classical] music is energizing me. It’s not just music. It’s the vibrations that resonate with the body and the spirit, and that makes one feel that way. Everything is the law of vibration. Music is a lot about vibration. One can feel it physically. When you sit in the concert hall, the music starts to resonate with the stage and people have goose bumps on their skin. It is the reaction of the body, which is extremely pleasant, but which is induced by the state of the spirit, a mental state. That’s what music gives me. Often, when I’m playing music, after a while, maybe after half an hour to an hour, I get into such an alpha state that I am able to create with an image of how my music will affect an audience. So in my imagination, I’m already on the stage and preparing what feelings people will experience during the concert. It is this kind of inner work that allows me to have great peace, calm, and quiet. The Epoch Times: Have you had any responses from listeners who can compare the effects of classical and modern music? What impact it has on them as human beings? Ms. Hosprova: I’m lucky that after my concerts, some people give me feedback. And I look forward to it a lot. Recently, one of my fans wrote me that he had come to the concert at the last minute. He had a terrible day. But eventually he sat down at the concert, and we started to play, and after the performance, he wrote me. During the concert, he found himself somewhere else. He even solved exactly the blocked issue, which did not work during the day. Suddenly, he enjoyed the wonderful music and saw beautiful scenes. Then he came back to reality and saw that the tragedy was not so terrible. Classical music has the ability to take the spirit somewhere else for a while. … Because your presence at the concert and the direct contact with an artist will draw you in, and at that moment, the listeners will feel relief. A similar effect may also happen to some extent with popular music. I would rather not call classical music “classical,” because the classical period was simply the Mozart period. I think it is “noble” music because it can lift us up, and that is the exact content of this type of music. I do not want to underestimate popular music, but I think it does not have that effect on us, to sit and just listen, because it is not as fulfilling as classical music. [With classical], you can sit an hour and listen, and there still will be something more to listen to. But in popular music, the songs have to be played faster, [and] they are much shorter, because the content lasts only for three minutes. We hear it every day on the radio, so it’s no longer a holiday when we hear it and listen to it. [But] when you take, for example, Mahler’s symphony that lasts one hour, people are in a positive tension the whole time, and there is still a story which the music can bring to them. The Epoch Times: How should the artist work on himself to ensure that his performance is of the highest quality? Ms. Hosprova: I play the best “when I’m not there.” When I, myself, am not there, then I give the best performance. The artist is just a medium. Of course, for years we learned the instrument and went to competitions to master the craft to be able to get the most from the instrument. One has to get to a very high degree of professionalism to stand on stage, because the instrument must work so that the listener does not feel that the playing is a problem for the artist. We must be liberated from any technical problems. Then, there is another level where we must be liberated from ourselves. Of course, some people do it by taking drugs, for example, in popular music. While in classical music, this approach is unacceptable because you need to control your physical body. … [Otherwise], the audience can easily notice. We should just open [ourselves] and let the music pass through us. No ideas, such as whether it is going well or wrong, should distract you in the moment of performance. There can only be the craft, and then an open consciousness, which connects to an audience, colleagues, a conductor, or an orchestra, and all of this is suddenly a big organism through which the energy of music flows and then it passes into people. If there is too much ego involved, the people might call it a great performance, but they will not go home with an uplifted soul. But sometimes, even though you can make a mistake, the music touches the audience. [Or] sometimes the “goose skin” doesn’t show up, even though the musician played well himself, and he cannot understand why. The reason is that the artist’s consciousness was not fully open. The Epoch Times: It is said that music is a product of the state of a man’s mind. Is it possible to somehow define what state it is with classical music? Ms. Hosprova: I’ve outlined it a bit. I am convinced that this is the state we describe as the “alpha” state. It is a partial meditation when I get into a deep concentration after half an hour of playing. That’s when I see exactly how the particular music should sound. I see it, and I just need to control the body so it does exactly what I want at the right moment. It’s like there is a space above me to where the music is written, and once I connect with this place, I know exactly how it is supposed to be played, and I know that no one will question me, and I will not make a mistake. Then, when I’m going on the stage, it’s good to get back to that concentration. I often play with my eyes closed, because then it’s a “way up” for me very fast [laughs]. As soon as my eyes are open, it is more difficult to concentrate. When I’m in that deep state of concentration, I’m not even thinking about music, not even what my hands are doing, … the body just gets the information about how to work so the music is played the way it’s supposed to be. The Epoch Times: This is a very different state from the one we have in everyday activities in society when we are often stressed. How do you manage to move between those two “worlds”? Ms. Hosprova: That’s why it is extremely destructive for artists when they have to work in a world where we are bombarded by email, phone calls … all this gets a person out of this state. … Of course, we also have to work. We live in this world the way it is. The artist has to prove his ability to go back to normal life and very quickly get back into a deep concentration, so it’s pretty good training. It is true that this higher principle helps me to solve things in ordinary life. I do not think much about it anymore, and I say, it will somehow work out … When one reaches this meditative state of mind by means of music, he is actually able to stand up to everyday, routine life. It’s a condition, [for example,] when one comes out of the opera, leaving one in an uplifted state, that all then somehow runs more smoothly. Then I have had the other experience. I was on holiday last year, and at the place where we stayed was a DJ festival. From 1 p.m. to the evening, every hotel on the beach was full of DJ music. After one week, I returned home deeply depressed. It took me about two days to recover from this anguish. It was hell for me. All the music was just pushing down into the bass tones. I just prayed to get out of there. It was a bit difficult, but it was a valuable experience. I know now that I will never go into such an environment again, because I was forced to perceive it; I was forced to understand what that might cause. Today’s young people are exposed to it. It was a big lesson for me. The Epoch Times: Why do you think today’s society produces music such as death metal or other things that remind us more of howling monsters or machine sounds? Why did such a deviation from the classical genre happen? Ms. Hosprova: Look around yourself at what we have here, what we are creating. During classicism of the Mozart period, beautiful buildings were being built. Look at the Baroque [period]: all the palaces, paintings, art, everything made in detail, and the music was just as thoroughly crafted. Today, we live in this state, in this situation, and music and artists just reflect our time. We are just a reflection of that. When you visit Berlin’s fine arts galleries from the 1950s, they held something quite different from the paintings of the early century. The Germans went through the war, and many artists felt guilty by what the German people did. It is modernism. There are horrible scenes that one cannot put on the wall. These artists had the need to get this out of their systems. And this is, perhaps, the answer to hard metal music or even to a hip-hop that is associated with beats, aggressive words, and cries of misfortune. People need to get these feelings out of them. Our time is how it is. But I’m not saying that the only music created nowadays is impossible to listen to. It’s just more complicated, because we are more complicated. But there are still some to choose from. Some composers still follow the line of [Antonin] Dvorak, [and Bohuslav] Martinu … There are still people who can compose from their hearts. The Epoch Times: You mentioned that vibration and resonance are very important in music. How do you think this aspect of music is developing today? Ms. Hosprova: It’s occurred to me that the true nature of the vibrations that can influence both players and listeners positively is actually in natural materials and natural resources. Just by having electronic instruments and amplifying the sound, we are getting into an art that is not natural to humans. Originally, people made wood-based instruments with what they had at hand, and everything was in tune with what we were able to bear. Electronic music is, for human ears, much too heavy. It is not in touch with the natural harmony. I’m not the kind of person who would play an electric instrument. I think the energy of the instrument that every person chooses must be—we say that there is a chemical reaction between the instrument and the interpreter. It’s alchemy. The instrument attracts you, and the energy it contains—these two tools, man and instrument, create a channel for music. The Epoch Times: Why is this so? Ms. Hosprova: People were softer and more relaxed in the past. It’s about, as I said before, it’s a reflection of our time. Translated by Vladislava Maskova. Interview edited for clarity and brevity.